This morning I woke up with the urge to make crab at home already. Going to Joe’s Crab Shack, and really just eating crab in general, is one of Luis and my favorite pastimes. Joe’s Crab Shack was just our first experience eating crab, and I LOVE their spicy boil flavor. I googled the nearest supermarket that had crab in stock, since there really isn’t an actual supermarket in Secaucus, unfortunately. I drove over to Lyndhurst grabbed 3 lbs of snow crab (for $19!!!!) and then I invested in a large seafood pot and seafood/nut crackers. These WILL be used again. I also googled to see if I could find someone who recreated the spice blend that I love so much, and lucky for me, Todd Wilbur did. I used to watch his show and saw him go up against a lot of famous dishes, like Outback Blooming Onion, Mrs. Fields cookies, etc, so I knew his recreation would be on point and decided to pay the $.79 for the recipe. I basically followed it to a T, except I did not cook potatoes with it. I miss his TV show! See how I recreated this below the (blurry) pic of my final product. 2-3 lbs frozen crab (which is most likely all you will be able to get your hands on if you are anywhere in my general area). I used 3 lbs of snow crab. Dungeness is my favorite though. Allow crab to defrost in the fridge for about 5 hours minimum. You can also defrost by running under cold water if you are in a rush, but don’t let them come to room temperature. Blend all seasoning blend ingredients together. Bring enough water to a boil that will be able to cover all the crab potatoes and corn. After 15 minutes add all but 2 tablespoons of the seasoning to the water and cook the corn for 5 minutes. After 5 minutes add the crab to the pot, cover and boil for 5-6 minutes more. Make sure you watch the time very carefully, you do NOT want to over cook this! Frozen crab is actually already cooked before it is frozen, so you want to JUST heat it enough, and not cook it further. 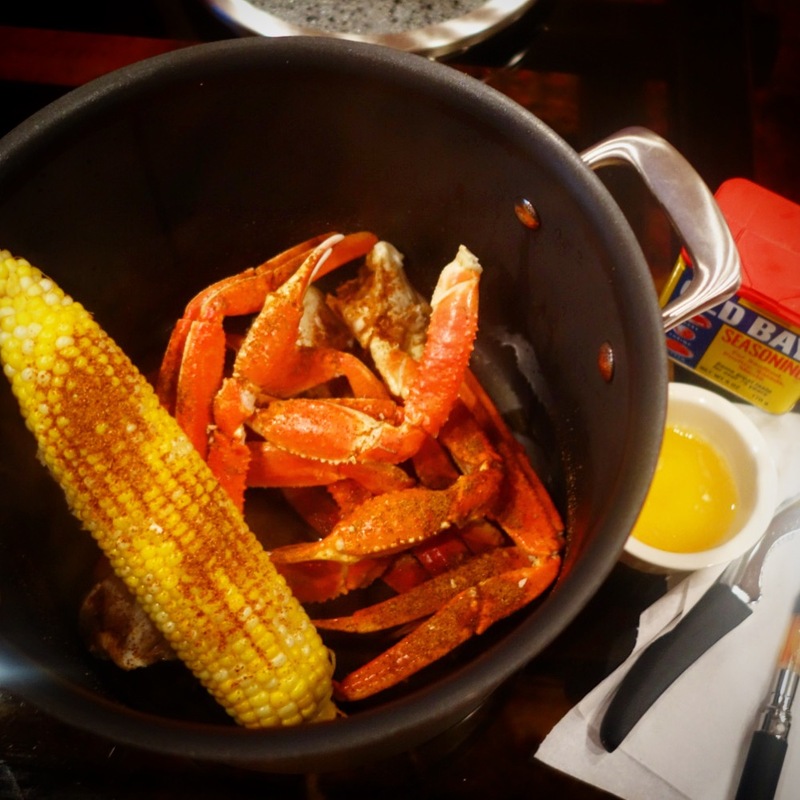 We like our crab to remain hot so I portioned our crab and corn out into 2 separate pots, poured over 1 cup of the hot broth onto each and then sprinkled the remaining spice blend over the top. I served it with clarified butter on the side. The butter is not only for dipping but for rubbing onto the corn, ftw of course. I like extra Old Bay so I just kept that close by. Lots of napkins. Anyone that knows me knows I am a napkin hoarder either way, but especially with this meal! To clarify butter you just melt the butter on a low flame. Once it is melted remove from the heat and let it sit for 5 minutes. You will see the milk solids form as a film along the top – skim that off and you have clarified butter! All I have to say is YUM. I wish summer would never end.